Due to funding constraints the East website has now finished its regular features about East Manchester. Whether you are looking to visit, live or set up a business in East Manchester you can still find all the latest news and information on www.east-manchester.com. Previous stories from East will continue to be accessible from this site. Use the search function at the top of the page or choose from the categories. Those interested in the on-going success of East Manchester’s regeneration may find the book, Reclaiming East Manchester: Ten Years of Resident-led Regeneration of interest. 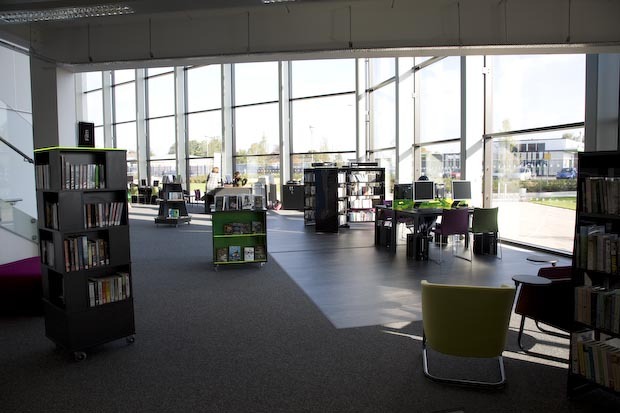 As the brand new Beswick Library opens its doors Len Grant asks Maxine Goulding how the role of east Manchester’s libraries has changed since books were loaned to local residents from a converted pub. 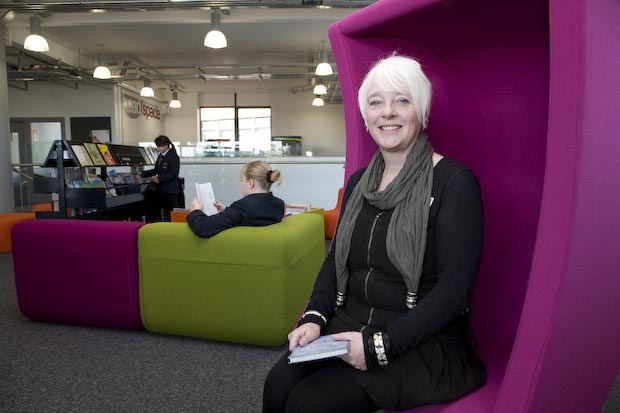 Maxine Goulding, Miles Platting Group Manager: "The new Beswick Library is gorgeous. We love it!" 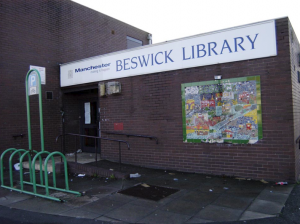 I remember, a few years ago, Beswick Library was here on Grey Mare Lane, not that far from where we are now. Yes, that’s right. We used to be in what was formerly The Bobbin Pub right next to the precinct. I’m sure it would have been the local for many of our customers at one time. It wasn’t a very large building but it had a lovely feel to it and we had a very successful homework club. We were very sad to come out of there in 2006 but, because it was a regeneration area, many of the houses were coming down, the shops were closing and we were losing customers. 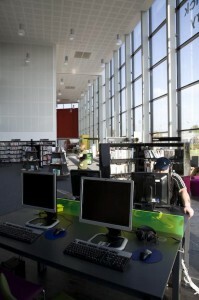 From there you set up the East City Library in what is now The Manchester College campus at Openshaw. That must have been a big step. Oh yes, we moved into this wonderful, large ground floor space that we shared with the college library. We thought it was gorgeous. 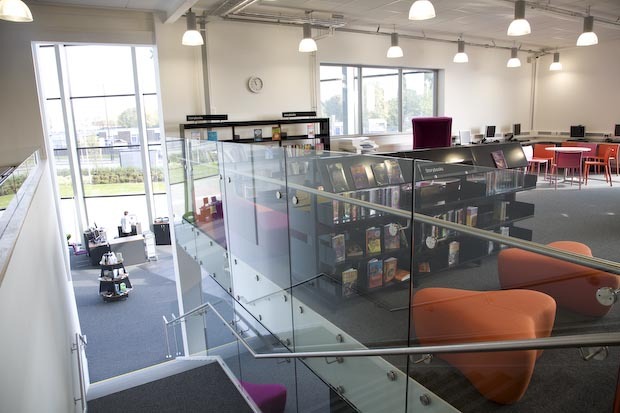 It was a big change for us because it’s a college and a public library and although we still have many residents using the library, most of our customers are students. Because we have plenty of space we are able to put on more activities and we enjoy lots of partnership projects like getting involved with the students’ end of year shows. The college has been great and we’ll still be at the East City Library as well as the new Beswick Library. Working in a regeneration area surely brings its own challenges? We’re very much a part of the regeneration story, fully committed to the social and cultural regeneration in east Manchester. It’s a new way of working because now we are collaborating with all kinds of partners. 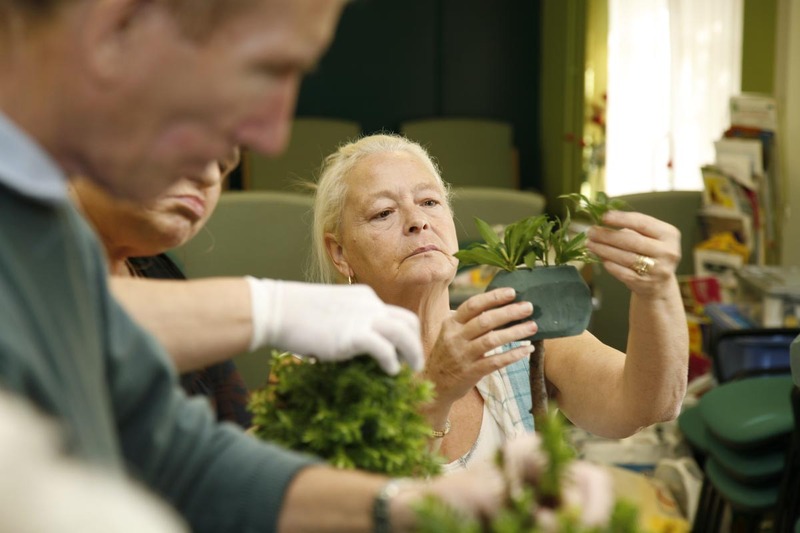 I attend ward meetings, youth meetings, health forums, Valuing Older People meetings: we’re using other people’s skills and resources to achieve a common goal. 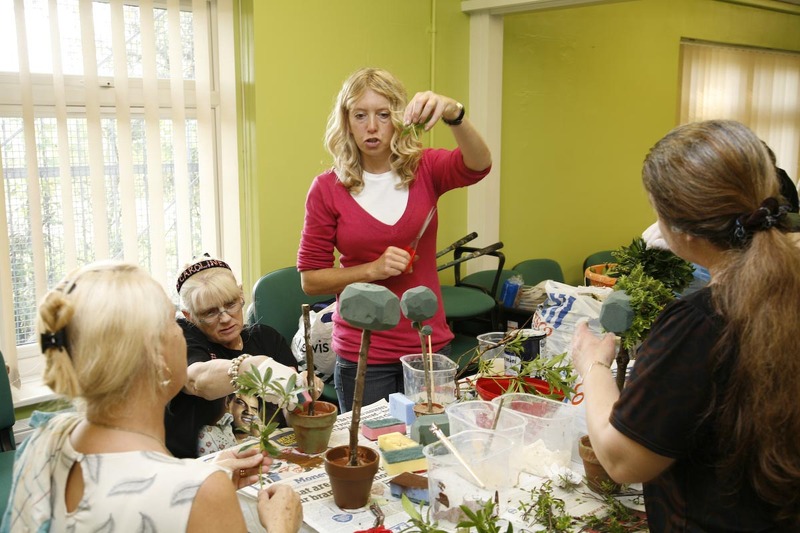 Communities are changing very rapidly and our libraries are changing with them. 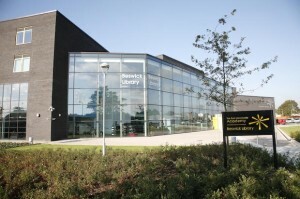 We have to work particularly hard in east Manchester to encourage people to use the library. Many still have a traditional view of what libraries were like: all dusty books and ‘quiet please’. But things are very different now and as soon as people walk through those doors they understand that difference. Our outreach work is essential. We get out there and tell people what we’ve got to offer and work with hard-to-reach groups to encourage them to use the library. For instance, we’ve run drama and sound recording sessions to promote the Manchester Book Awards and we’ve had artists working with youth clubs on art projects in the libraries. 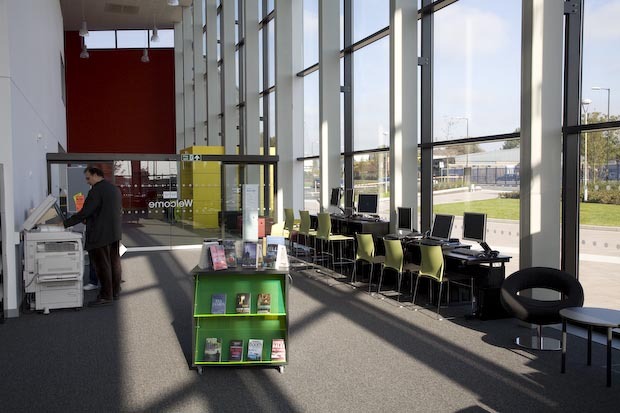 And now you’re back in Beswick with this wonderful library alongside the new East Manchester Academy. We were always going to come back. 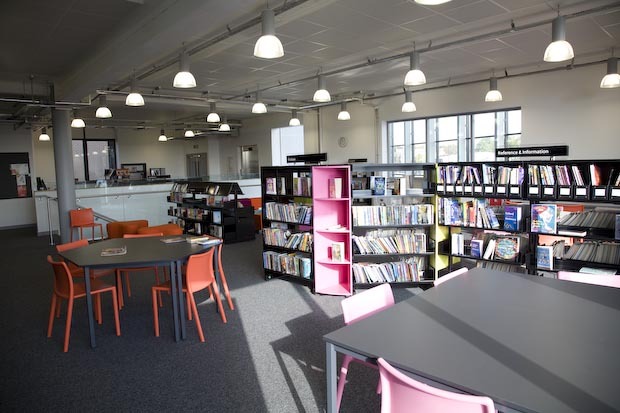 We’ve been involved with the design of the building from the very beginning and we’ve worked closely with the Academy promoting the school and the library together. We’ve got the same customers. I just love it. The space is amazing and with the light pouring through those tall windows, well, it’s just a wonderful building. We’ve got community meeting rooms and a community space for larger events as well as all the services we now offer throughout the city. Of course we’ve got all the computers and – what some people don’t realise – we’ve got staff on hand who can help. So, even if you haven’t used a computer before, you can book one-to-one sessions and be taken through the very basics by our friendly staff. It’s a lot less daunting than booking on a college course. 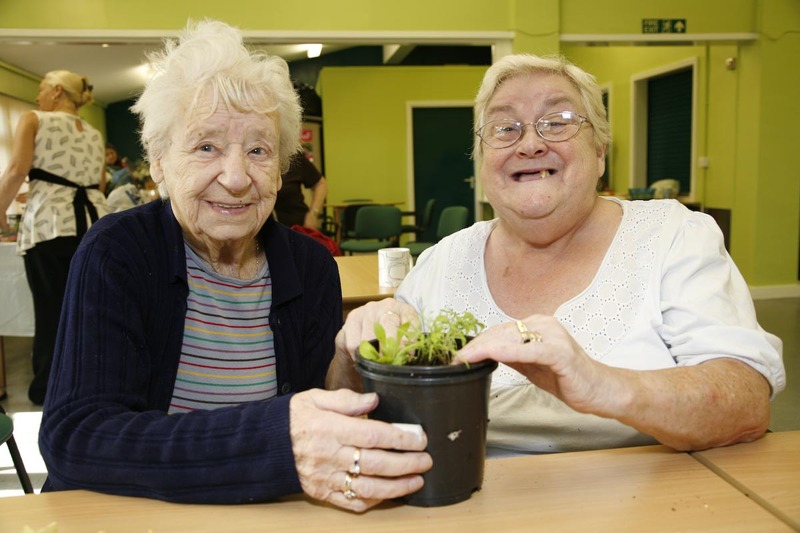 I love working in east Manchester because I feel we have been making a real difference. Being part of the regeneration effort is very exciting. Many homes still don’t have internet access and we can offer all that – and more – here. We’ve made a huge impact with our homework clubs and now that we share the building with the Academy and we have extended opening times, we can build on that success even further. Click here for opening times, facilities and lots more. 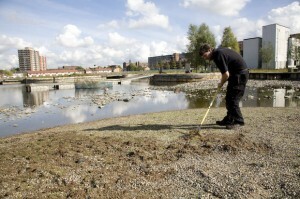 Ben Knott has been the park keeper at New Islington for the past two years. He says it’s the best job in east Manchester. Len Grant pops down to Cotton Field to take a look. 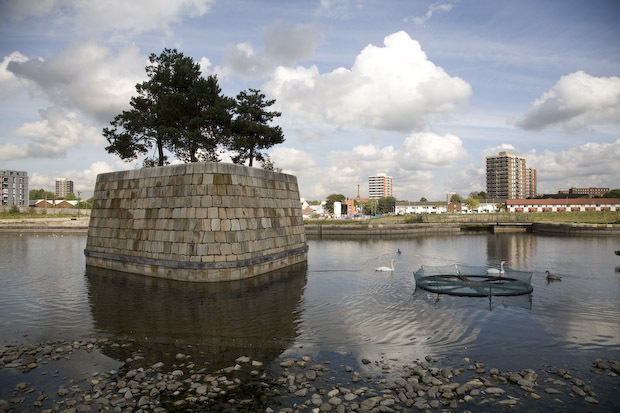 Ben Knott: "I creep on in the mornings to watch the herons." It’s idyllic. A park in the city. 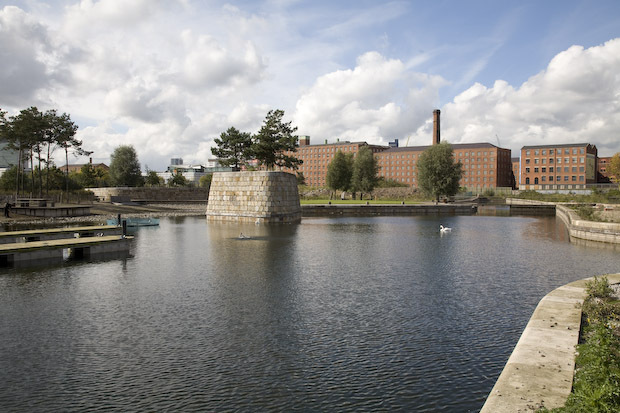 A canal basin links the Ashton and Rochdale Canals on either side. There’s a shale beach, reed beds, wooden jetties, but no people. 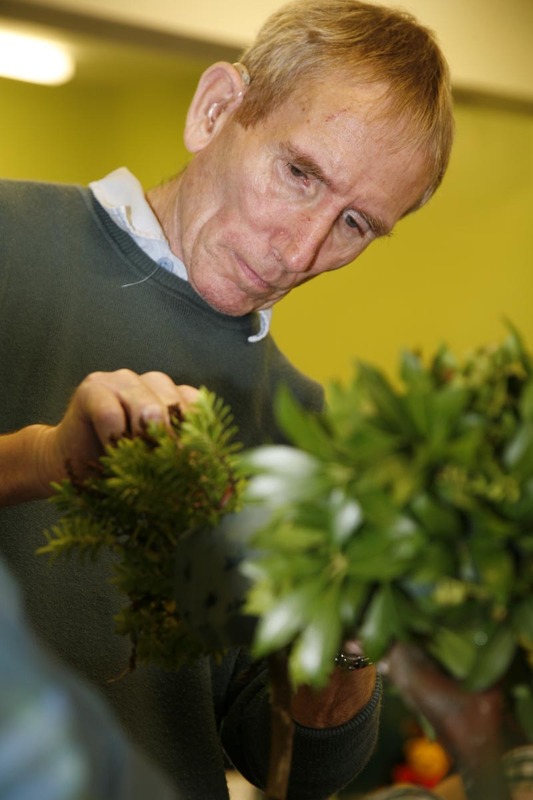 Previously a gardener looking after over 50 gardens around Manchester for a mental health charity, Ben’s role here is particularly diverse. “I don’t just look after the park, I keep an eye on the whole New Islington Development. I maintain Old Mill Street and the other open spaces. I’m down here every day and there’s plenty to do: cleaning, brushing, mowing. I’ve had to keep the weed down in the water otherwise it might have completely taken over by now. But the park is maturing now, reaching an equilibrium with all the birds, plants and animals we have on here. Mostly on his own on Cotton Field, Ben has been able to observe the influx of wildlife onto the park and, as a keen ornithologist, is able to identify all the species of bird that are making it their home. “I creep on in the mornings and watch from the gates for a few minutes before coming in. The herons are the ‘early birds’, standing on the floating islands, looking for newts. They are not as wary of me now… they’ll let me wander around for a while before they fly off. Of the six eggs laid, one cygnet has survived. Once the park is populated won’t all the wildlife disappear? “I don’t think so. So much of it is well established. Once all the development is complete we might not see the lapwings and ring plovers again because they prefer the large muddy areas that we have now but will eventually be built on. Most everything else will stay. 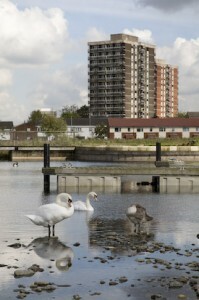 The swans actually like people and, as they only started nesting this year, they’ll probably make this their home. They made their first nest on one of the floating islands earlier this year. Once the female was settled the male left for 10 weeks – is that what they call ‘swanning off’? – but came back three days before the chicks were born. It was so aggressive in its protection of the young that it actually killed a Canadian goose, drowned some of their young and forced the other geese off the water. Of the six eggs that the swan laid, four survived for a couple of weeks and now there’s only one cygnet left. I don’t know how the others died, maybe the fox got them. 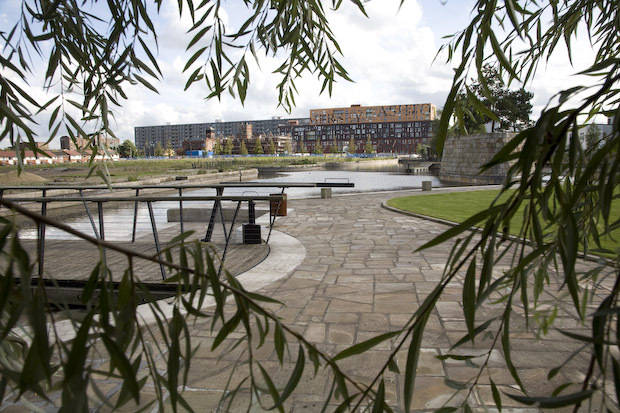 See the New Islington website here. 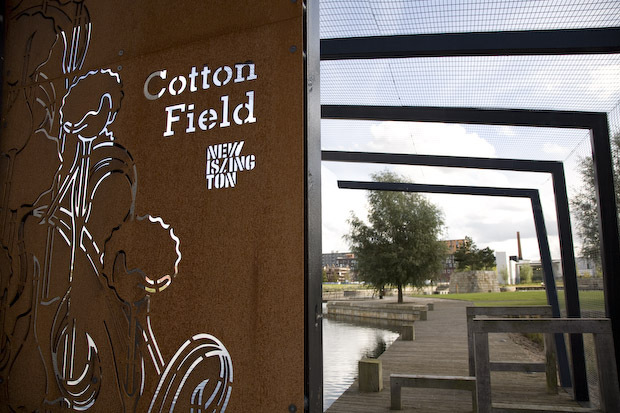 Cotton Field: adjacent to the renovated mills of Ancoats. From next Spring, a tranquil spot for residents and visitors. Cotton Field, named following a competition. The island has nesting holes left in the stonework. East Manchester’s Food and Drink Fringe Festival has now kicked off! There are 20 mouth-watering events this month across the area. 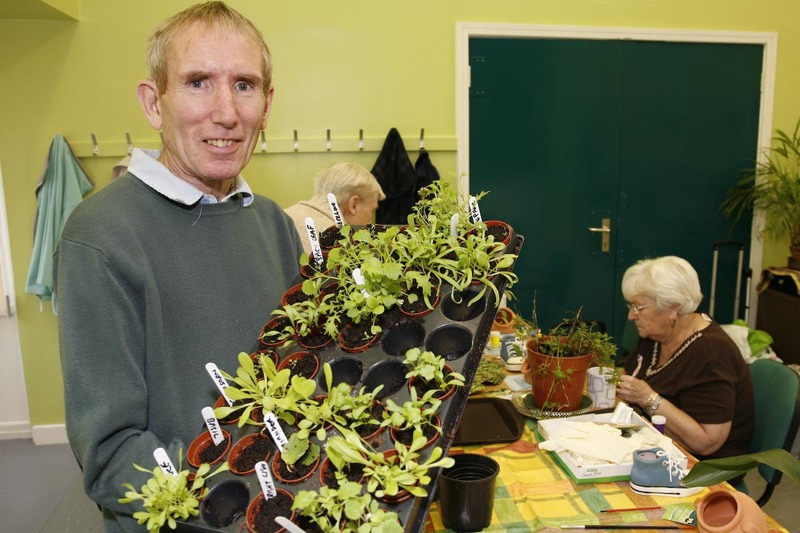 Len Grant calls in at a community centre in Newton Heath to see one of the first. I’d intended to drop in at The Stirling Centre in Newton Heath and take a few snaps of the very first event of the 2010 East Manchester Food and Drink Fringe Festival. 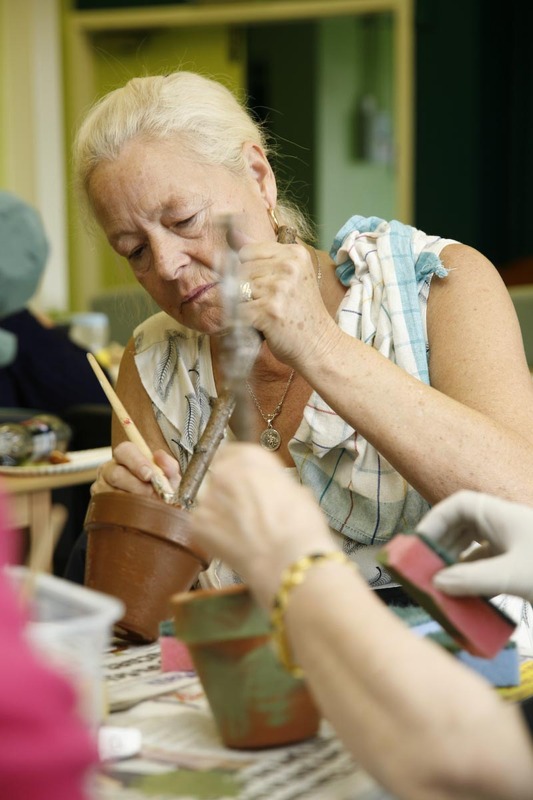 Sure enough tables were being laid out for the Fringe’s ‘How Does Your Garden Grow’ workshop but there was already a flurry of activity across the hall as members from the Over 50s Forum were busy painting plant pots. I wasn’t expecting two events for the price of one! 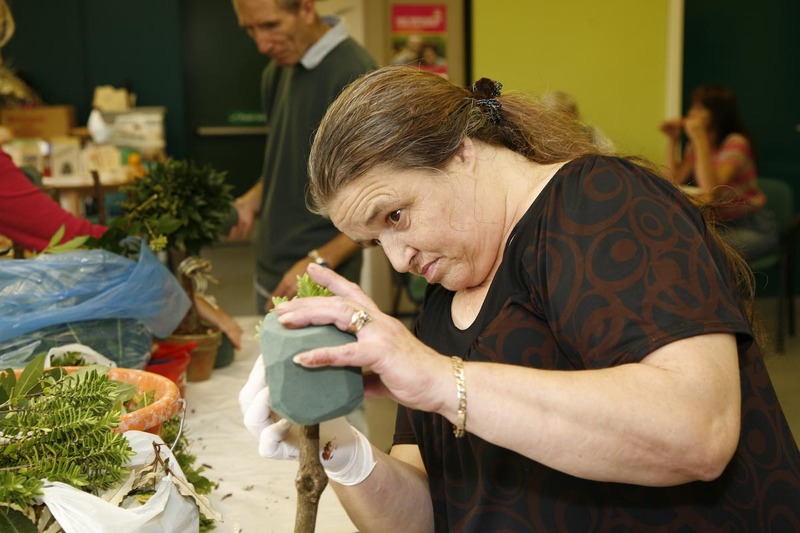 Liz Lomas from the Forum explained: “Every year the city council’s Valuing Older People programme puts on a fortnightly Full of Life Festival to celebrate older people and encourage more participation in the community. One of the themes this year is ‘Grub and Gossip’ and that’s what going on here. 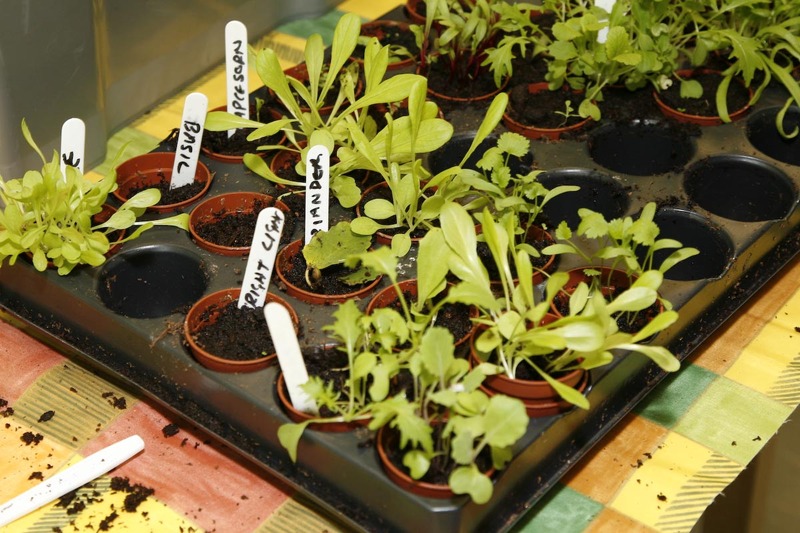 We’ve got herbs and seedlings and packets of seeds which will go into the plant pots once they’re painted. 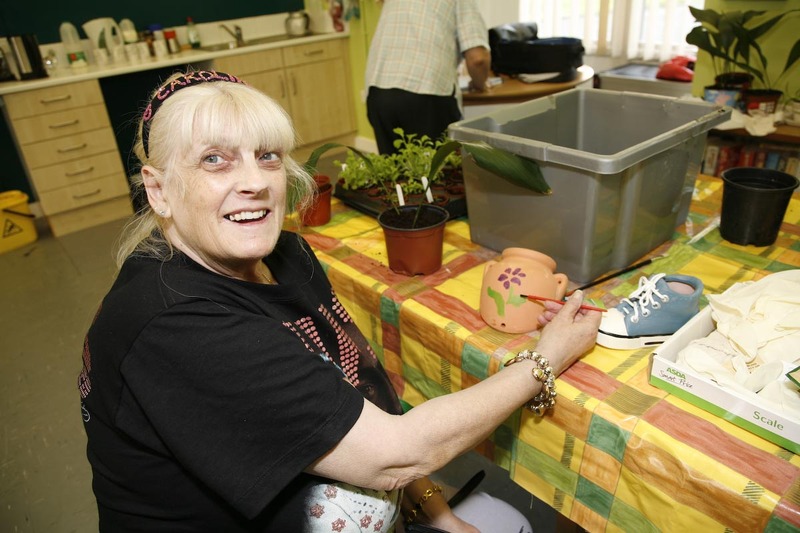 Esther Parnell: "The last time I painted was with the grandkids!" 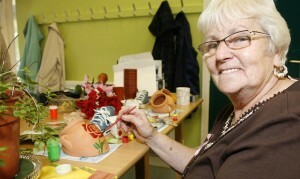 There was plenty of gossip going on as the pots were decorated: “The last time I did anything like this it was colouring-in with the grandkids,” said Esther Parnell as she added another petal to the red rose she was painting on her ceramic pot. The grub came in the form of a splendid buffet provided by Liz’s colleague, Brenda Austen. 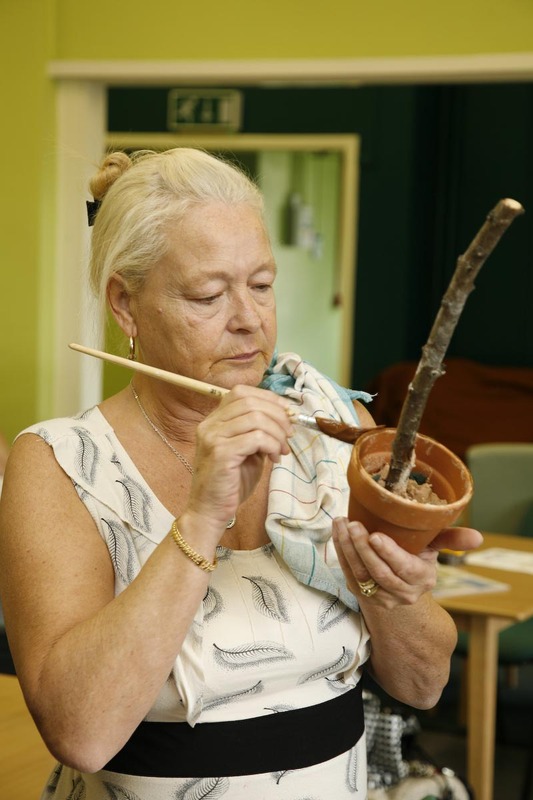 Once the pots were filled with compost and seedlings and the participants had had their fill of sandwiches and mini sausage rolls, it was time to turn to the Fringe Festival event staged by community artist, Michele Hawthorne. 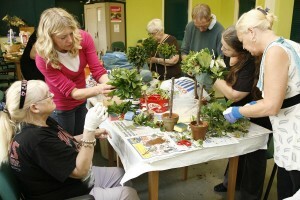 This group don’t need much encouragement and within minutes the table was full of green-fingered enthusiasts.